I watch a lot of youtube music videos. I bet you do, too if you are an aspiring singer. No matter who you are, there are many Youtube music videos (thousands of them) that relate to your style, your age, and your dreams about singing. Most of us watch for pleasure. We enjoy seeing others do the things that we would like to do. But not too many of us watch videos with one specific goal in mind.... "What can I learn from this video that will help me to sing better?" 2. Ask yourself what it is about this singer that has made him/her a successful performer. For example, with Michael Jackson, it was his ability to dance and his great rhythm. Choose one or two characteristics that YOU like about the singer you have chosen. 3. Now watch the video while you concentrate on how s/he expresses those qualities in this performance. 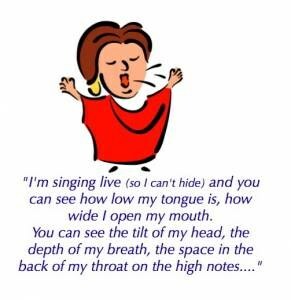 For instance, if you are impressed with your singer's voice - watch carefully how s/he breathes, (some info). Listen to how s/he phrases, how s/he uses her/his mouth, tongue, jaw to create a unique sound. If possible, watch Youtube music videos of LIVE performances. We know that many, if not most professional music videos are dubbed with a high quality recorded version of the music we hear. Those singers are often not singing the music that you are hearing. So if you want to watch how they REALLY produce their sound, watch them in a live performance! 4. 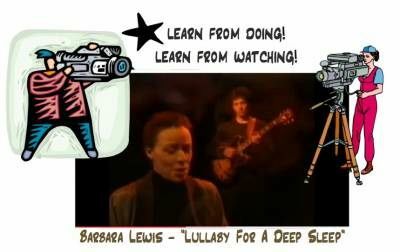 Watch the same video again, this time concentrating on some other aspect of the performance that grabs your attention. The way your singer moves, perhaps. Or how they interact with other members of the band. Perhaps you are amazed by how this vocalist handles a microphone. Watch carefully. Think about it. Try it with your own microphone! The point is to STUDY what others do. And then, try it for yourself. Set up your own video camera and watch yourself in action. Over time, YOU can create your own version of another singer's scintillating moments. making a song your own!). Some singing careers last decades. If you are serious about singing, decide that you are in it for the long haul. Amateur or hopeful-pro, aim to make wonderful music for many years. Watching Youtube Music Videos can help you with that, too. Marilyn Maye in 1967. And watch her now - 44 years later! For you men singers, (even though we can learn from watching both men and women) have a look at the remarkable Tony Bennett then and now. Take advantage of the endless number of Youtube music videos that can give you important insight into how to sing better.